Enhancing your outdoor audio begins with finding the right speakers. We love working with great brands like Sonance, Klipsch, Origin Acoustics and Bose. They offer monitor speakers you can mount on or in the ground, walls or ceilings. This month Klipsch is releasing a new line of landscape speakers that can blend into your foliage so you get the sound without the bulk. Once you have your new speakers, it's time to think about the right layout. Have speakers evenly spread out, so you don't end up with blowout zones where the music is too loud. They should all be facing towards your house. This way you can strengthen your audio by bouncing it off the wall and avoid annoying your neighbors. There’ll also be moments when you want to benefit from the perks of an outdoor television. You can invite friends over for a cookout for Football Sunday or enjoy the Spurs’ latest playoff run under the perfect spring weather. 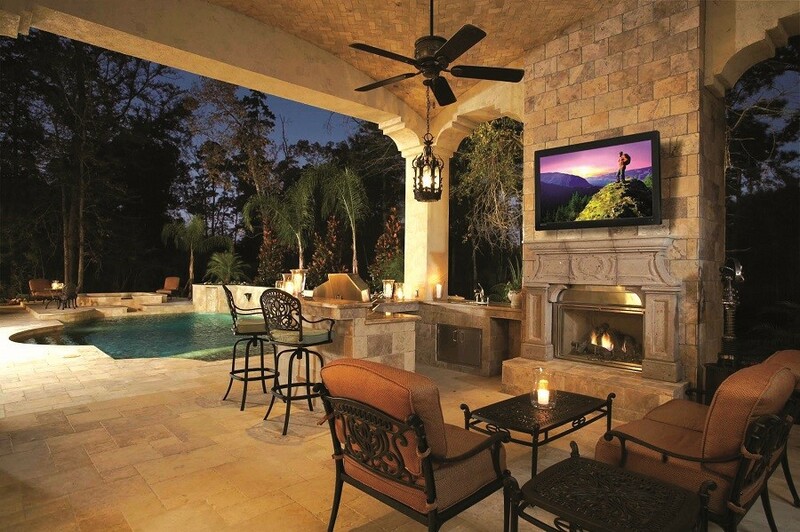 When it comes to watching video outdoors, we recommend going with a Seura TV. Not only is the television built to survive the toughest weather conditions –from thunderstorms to blizzards—but it’s designed to be watched in front of direct sunlight as well. You won’t have to deal with glare interfering with your 4K Ultra HD images. With sizes ranging from 42 to 84 inches, there’s a variety of options whether you want to build a custom theater on the lawn or simply add a TV to your patio. We can also install outdoor projectors and screens to view your favorite movies. These days many people rely on streaming services for movies, music and more. However, most consumer networks don't offer strong enough coverage to provide a reliable signal outdoors. You can invest in wireless access points that relay your Wi-Fi signal throughout your home. Many companies offer outdoor varieties that you can place near your patio or pool to make sure your movies don't freeze up, and your playlist doesn't cut out halfway through. With a home audio video system in place you can keep your source components inside and use matrix switchers to relay the signal from your Blu-Ray, CD player or media library to your outdoor components. The other perk of this kind of system is that you can centralize control. From the same touchpad, smartphone or waterproof remote you can pull up Spotify, your Kaleidescape Movie library or your satellite TV. You can even adjust your landscape lighting from the same device. Are you sure you’re getting the most out of your outdoor entertainment? Contact Sterling Home Technologies for a consultation.